We’d love your help. Let us know what’s wrong with this preview of Return to Ithaca by Mary Pope Osborne. 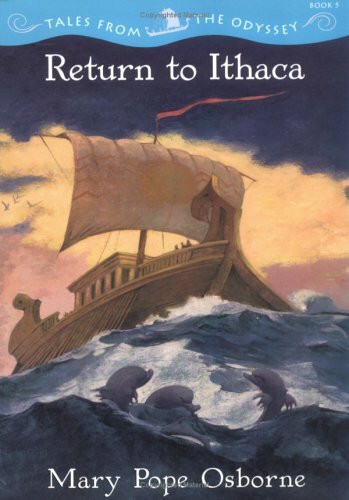 To ask other readers questions about Return to Ithaca, please sign up. This is the fifth book in the Mary Pope Osborne's translation of Homer’s The Odyssey. Odysseus journey is nearly at an end and this book sees him finally being released from his island prison and making his way home. The story is interwoven with that of a new character Eperitus, not in the original saga but added as a best friend foil to add some more drama to the story. Eperitus blames Odysseus for the death of his wife and child but struggles with his anger towards that and his love of his best friend. 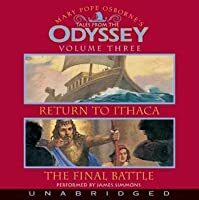 The tales from the Odyssey series is great. The stories are told in a way that a young reader can enjoy on his own. They are not intended to be deep, but they do present the stories and adventures Odysseus encountered on his long struggle to get home from the Trojan War. Mary Pope Osborne knows how to tell a story. Setelah 20 tahun mengalami penderitaan tak berkesudahan, akhirnya Odiseus dapat kembali ke Ithaca dengan bantuan Dewi Athena. Salut dengan keramahtamahan para raja terhadap orang asing. Bahwa atas perintah Zeus, mereka harus memperlakukan orang asing dengan baik. Bahkan sebelum mengetahui latar belakang dan tujuan kedatang orang asing tersebut, mereka tanpa ragu menjamunya. Sungguh suatu adat istiadat yang hampir sulit ditemukan dewasa ini, di mana orang-orang mudah sekali menaruh curiga. Salut ju Setelah 20 tahun mengalami penderitaan tak berkesudahan, akhirnya Odiseus dapat kembali ke Ithaca dengan bantuan Dewi Athena. Great illustrations throughout the books, just wish they were bigger... Thought it was very easy to read and still had all the right contexts to make it a Homer tale. Very well edited book for young reader's who can enjoy Homer centuries later. This is the fifth book in the six-book series, Tales from the Odyssey by Mary Pope Osborne and Troy Howell. This story continues its dramatic saga, but Odysseus is finally home and there is hope for a happy ending out there on the horizon. Poor Odysseus. When we started reading this series, I was a bit afraid that our girls would have nightmares, but they took the story in stride. Overall, this was an exciting and intense saga. We are looking forward to the next (and last) book! The Odyssey is great book. If you have not read the Odyssey you have to listen to this. He was away from his family for 20 years. He got help from a village. They have the finest ship and crew. They let him sleep in the boat but the next thing you know he's at home. A villiger helps him out, to get home becouse he can't fined his home. And I don't blame him. It was a great serie. But hey! I wanted to know how penelope react when she saw Odysseus ! This one seemed to move a bit faster than the others, or maybe that was because I read it in one sitting at the dentist's office yesterday, but I enjoyed it. 03/16: Excellent series. Perfect first study of the Odyssey for little ones. FYI: #5 is hard to come by. Read aloud with the 4 year old. This was a great adaptation for kids to get a bit of these old stories and like i said before they read very well and any person ypung or old could get into them that are short and sweet. It is very different to see the stories in more than one series. Mary Pope Osborne has channeled a lifelong love of exploration and travel into one of the most popular children’s book series of the past two decades. With her fantastic Magic Tree House series, Mary Pope Osborne keeps the good times rolling for kids all over the world.